Robert Sabuda (previously) writes, "It has long been a dream of the Leonardo da Vinci Robot Society to bring one of the Renaissance Master’s creations back to life. 2019 is the 500th anniversary of da Vinci’s death and the Society has chosen to honor his memory and celebrate his life through one of his best known inventions - the Robot Knight. This robot is an early proto-computer android whose read-only programmable memory allowed it to perform many actions. And it was also rumored that the robot’s arm could also perform an extremely complex task…draw a picture!" "The Society has hired me to unlock the secrets of da Vinci’s robotic arm. 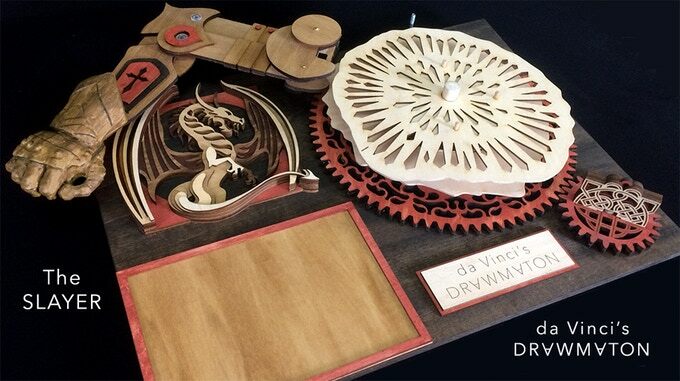 The final result, in the form of a kit, is now available to you as da Vinci’s Drawmaton. Made only of wood and a few pieces of metal, this ancestor of the programmable computer, is capable of reading 1kb of analog memory via wooden “petalos” which, to da Vinci, resembled the petals of flowers. The programming “petalos” are easily switched out so the Drawmaton can draw an endless variety of single line images. A few turns of the hand knob completes a full rotation of the programming “petalos” and the drawing is complete. You can insert your own drawing tool into the robot’s hand, place any paper into the draw area, turn the knob and the drawing is revealed. Program your own images to create custom “petalos” which will draw your own masterpieces!" Sabuda is an eminent mechanical engineer who created some of my favorite pop-up books. The Drawmaton comes with three different plotter-arms: a robot-hand, a skeletal hand, and a mailed fist. The engineering is incredibly clever, and the video demo is mesmerizing. The project does not give any details of similar projects that the participants have pulled off in the past, which makes this on the riskier end for Kickstarters. Prices range from about $100-about $180, depending on which hand you want and whether you want two or eight "petalo" program discs.